This article is about World 1 from DK: King of Swing. For World 5 from New Super Mario Bros. Wii, see here. 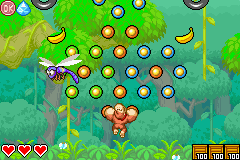 Jungle World is the first world in DK: King of Swing. 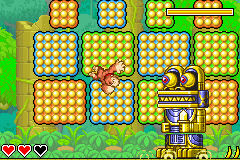 As its name suggests, it takes place in a jungle, where there are four different levels and a boss stage. Congazuma is the boss of this world, residing in Congazuma's Castle. It is the only playable world in the game's kiosk demo. Geographically, Jungle World is a vibrant jungle with a mountains to the north and a river throughout the area. Fallen trees or columns of derelict ruins act as bridges to cross the river's paths. There is a pyramid in the northeastern area of the jungle, which Donkey Kong will explore in a level. 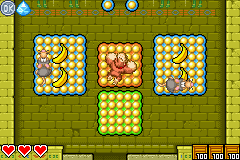 The first area to explore is Banana Bungalow. 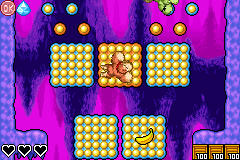 It is a basic jungle level, and Donkey Kong's Treehouse is featured on the map near it, implying Banana Bungalow is the area immediately outside of Donkey Kong's house. Beyond the first level, the path splits into two. DK can go to either Tropical Treetops, which takes place on an island in the middle of the world with a thick forest, or Contraption Cave, which is in a cavern near the mountainous peak of the area. After completing either, Puzzling Pyramid will proceed it. Upon finishing all four levels, the area boss, Congazuma, follows. 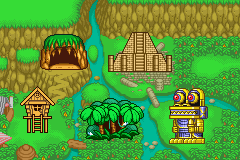 Jungle World seems to be modeled after Kongo Jungle from Donkey Kong Country, in the sense that half of the stages in this world are jungle-based, there is a cave level, and the area for the first stage features DK's treehouse on the map. The pyramid in this world may have been derived from the temple levels of DKC, particularly the one in Monkey Mines, being Millstone Mayhem, given the fact that Monkey Mines is within close proximity to Kongo Jungle. Tropical Treetops Tropical Treetops is one of the levels accessible upon completion of Banana Bungalow. It is similar to the first level, and it features pegs that revolve around an area. 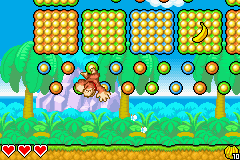 Flitters are more abundant in this stage. Contraption Cave Contraption Cave is one of the levels available after finishing Banana Bungalow. This level introduces levers and valves as interactable objects that can influence how Donkey Kong travels in the level. It also introduces Neek enemies that scurry on peg boards and a Kritter that climb and jump across pegs. Puzzling Pyramid Puzzling Pyramid is similar in style to Contraption Cave, where Donkey Kong must use valves to progress in the stage. Their application is different than before, however; Instead of making pegs appear or making DK move, they will either move an obstacle out of the way or move the pegs themselves. The final area features a lever that must be pulled repeatedly in order to open a path to climb safely. Congazuma's Castle The boss of Jungle World is the statue Congazuma. Donkey Kong can defeat it by landing a charge attack on it four times. Each time it is hit, it will become red colored and untouchable for a brief amount of time before resuming its normal habit of jumping around aimlessly. This page was last edited on April 4, 2019, at 20:22.